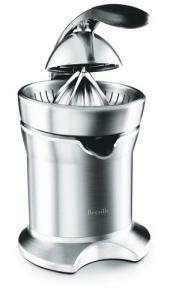 This juicer is one of those gadgets that you may see in a catalog and say "unnecessary and overpriced". Well, that's what I said anyway. Then I had the opportunity to try one out and fell in love with the gorgeous design and the thoughtful details that make this a big step above the other citrus juicers on the market. The first thing you notice is just how substantial it is. Heavy cast stainless steel and aluminum components throughout, this weighs in at over 18 lbs! Every surface has the same brushed metal finish, and the parts fit together seamlessly. The action is automatic- you place half the fruit onto the cone, then press forward and down on the soft grip handle. When the handle section covers the fruit and begins to press down, the unit activates and spins against the fruit to produce juice. When you raise the handle, the unit stops. Besides convenience, this is a built-in safety feature. This citrus press comes with two filter bowls, one fine and one, um, less fine for those that enjoy more pulp in their juice. One feature worth note is the hinged pour spout that you can raise when you are done juicing to stop any dripping on the counter. That's one little detail that has bugged me about every juicer I've used in the past. Also, this is very quiet when in operation. You won't wake anyone up with your early morning juicing. The "Quadra-Fin" juicing cone is said to handle any size citrus fruit from limes to grapefruit. It has no trouble with the smallest of limes, but large grapefruit are juiced less completely around the edges. I would suggest sticking with smaller grapefruit. The parts all snap out for cleaning, and the cord wraps underneath for storage. Every once in a while, an appliance comes out that is so thoughtfully made it's just plain fun to use. I'm off to buy another bag of oranges.